McDonald's, facing pressure from increased competition, says it has found a recipe for success in $1 drinks and a new line of high-end hamburgers. The fast food pioneer had its highest quarterly sales at established stores in five years in the three months to the end of June. The firm credited its turnaround efforts, which involve remodelling stores and using better ingredients. 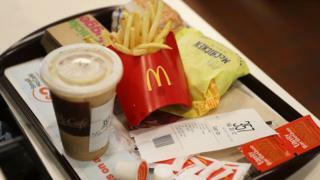 Now appetites are returning, said McDonald's boss Steve Easterbrook. The UK, for example, had the highest monthly sales in its history in April. "We're building a better McDonald's and more customers are noticing," said Mr Easterbrook, the fast-food giant's British-born chief executive. The fast food giant has started a move to use cage-free eggs and fresh beef rather than frozen patties for its quarter pounders in the US. It has also scrapped ingredients with high fructose corn syrup and artificial preservatives. McDonald's shares jumped more than 3.4% after the company released its earnings , which showed profits 28% higher year-on-year, lifted by changes to its real estate portfolio, cost-cutting and other initiatives. Total revenues remained lower than the same period in 2016, down 3% to $6bn, but momentum was building, the company said. Mcdonald's, which has more than 37,000 restaurants globally, saw sales at stores open at least 13 months jump 6.6% from 2016, more than double the growth rate a year ago. "Everyone is working hard to up their game," Mr Easterbrook said suggesting the firm was squaring up to the increasing competition from other fast food chains. "Our gain will result in pain being felt elsewhere," he said. McDonald's said customers are responding to new offerings, including a new line of signature sandwiches, such as the BBQ, with bacon, coleslaw and cheddar in the UK. In the US, McDonald's has also started selling any size of fizzy drinks for $1 and beverages such as smoothies and frappes for $2. The value options are convincing guests to return more often, it said. The company is also expanding its delivery and mobile payment options to emphasize convenience. But getting the basics right is just as important, Mr Easterbrook said. "We can never underestimate the importance of clean bathrooms, friendly service and hot, fresh food," he said. In the US, the firm's biggest market, sales at established stores increased 3.9%, compared to 1.8% a year ago. The UK, Canada, Germany and China were also strong markets, the firm said. The UK had its 45th consecutive quarter of positive comparable sales.